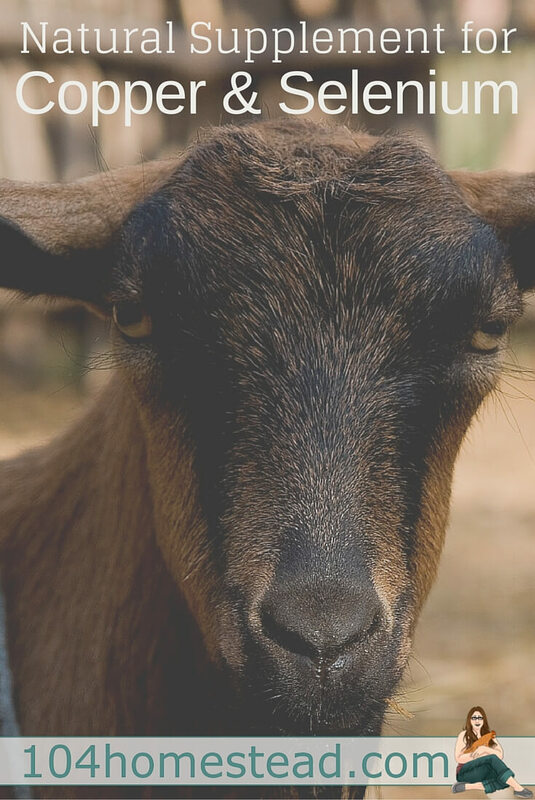 You may have heard that your goats need a selenium supplement and/or copper supplement and for many goat owners that’s true. This is because the soil across most of North America is deficient, therefore growing deficient plants. 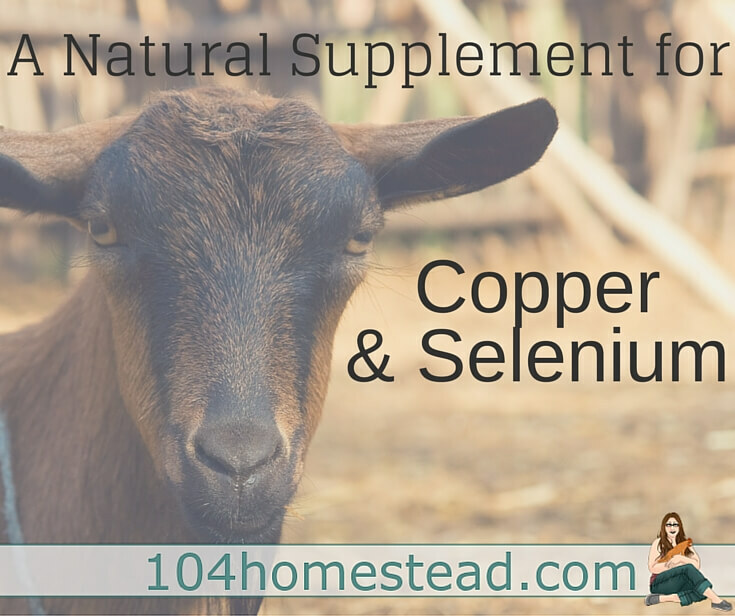 Living in a deficient area myself, I offer my goats a natural selenium supplement treat that takes advantage of the power of herbs. A map of selenium levels throughout the lower 48 states. Selenium deficiency is mostly noted during and after pregnancy both in the doe and any resulting kids. Deficient does will have trouble getting pregnant and maintaining pregnancy. Kids will be born stillborn or weak (often with white muscle disease). The doe will have lower milk production which compounds problems if a kid is already born weak. It’s very important that pregnant does receive an adequate selenium supplement. Copper is responsible for the pigmentation of hair, a dull and faded coat is often the first sign of copper deficiency in goats. Signs of deficiency may also include hair loss around the face, a bald or “fishtail” tail tip, and pregnancy loss. Commercial grains often contain copper, so deficiencies are more likely in bucks and wethers. Injectable selenium supplements and copper boluses are available, but some goats have died from toxicity after receiving injections and other goats have died of overdose after receiving boluses. 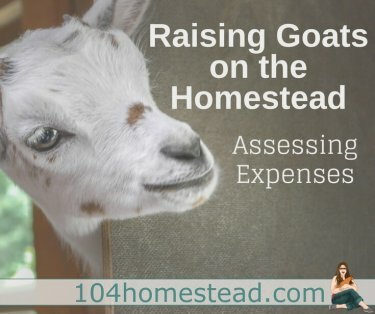 It is important that you assure that your goat is deficient and carefully measure out the dose (calculated by how deficient they are). With the herbal option, Mineral Mojo, there is some wiggle room. Herbal sources of copper and selenium include alfalfa, bringham tea, burdock root, catnip, cayenne, chaparral, chickweed, comfrey, lobelia, nettles, raw pumpkin seeds, red raspberry leaves, and rosehips. Many of these herbs are in the secret recipe behind Mineral Mojo herbal goat treats. Hi Jessica! Really, I like your blog! I was reading about your goats health supplements and deworming, it this the same treatments fot sheeps? Thank you for all your homesteads ideas! Looking at trying the Kop-Sel…how long will the 16oz size last if you give them the 1/4 tsp serving daily? I have had the same bag since April with four goats and haven’t used it up yet. I’d say it lasts a pretty long time.